Check out The ReFresh Team on The Radical Connection Radio Show w/ Apostles Renaldo & Angela Morgan on The Media Page!!!! 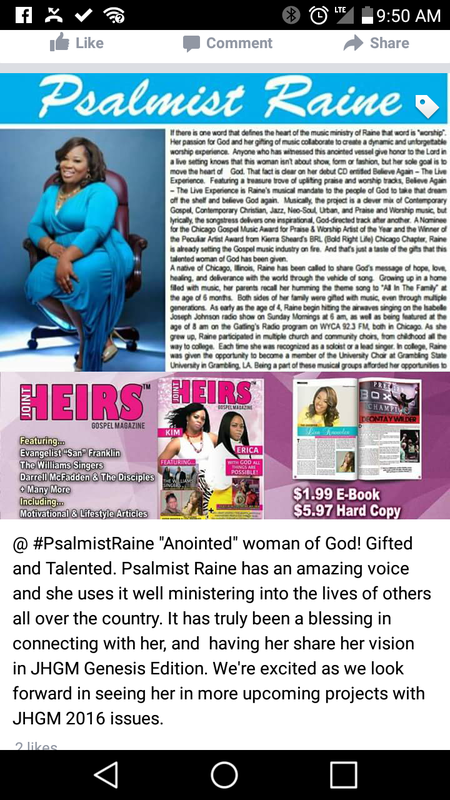 (Chicago, IL) – March 3, 2015 - Many Chicago area Gospel music fans are familiar with the powerful music ministry of Raine. Known as an unapologetic minister of music, she was formally introduced to the Gospel music industry with her debut CD, Believe Again, which released in 2013. 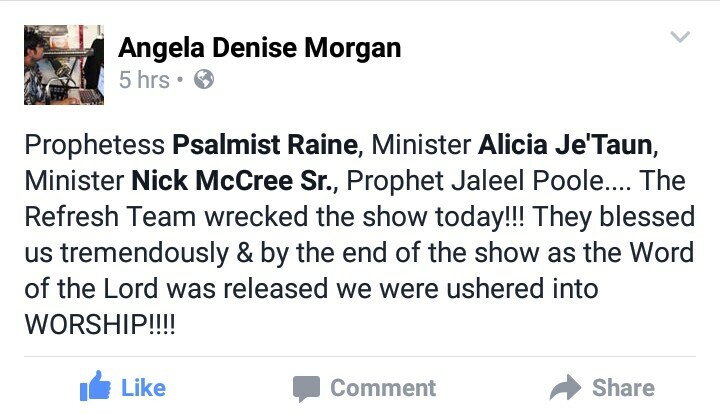 The praise-packed CD encouraged believers with dreams on the shelf to dust them off and believe God again. The critically-acclaimed praise and worship project helped the songstress receive a nomination for the Chicago Gospel Music Award for Praise & Worship Artist of the Year and win the Peculiar Artist Award presented by Kierra Sheard’s BRL (Bold Right Life) Chicago Chapter. Now the singer and songwriter is helping to inspire other worship leaders with her worship summit called “ReFresh: A Worship Leader’s Well”. ReFresh is a Kingdom organization purposed to help build true worshippers in the Kingdom of God. Inspired by the 4th chapter of John, ReFresh endeavors to edify worship leaders, worship teams, and the like in worship arts. With sessions held every other month near the Windy City, ReFresh allows Raine to share wisdom on a variety of topics including the power of corporate worship, the importance of personal worship and the visual expressions of Heaven. “I started ReFresh because I saw a lot of worship leaders experiencing burnout,” Raine says. “Many worship leaders pour out on a regular basis but are not poured back in to. I understand what that’s like. ReFresh is that outlet for renewing. Through ReFresh I want to give them the tools they need to sharpen the gifts the Lord has given them,” she says. The next ReFresh session will be held on Saturday, March 14th and is titled “Yielded Altars”. The event will take place at 10:00AM at Salem Evangelical Lutheran Church (12951 S. Maple Ave., Blue Island, IL). For more information about ReFresh or to register, log on to www.befresh.com or e-mail bookraine@yahoo.com. 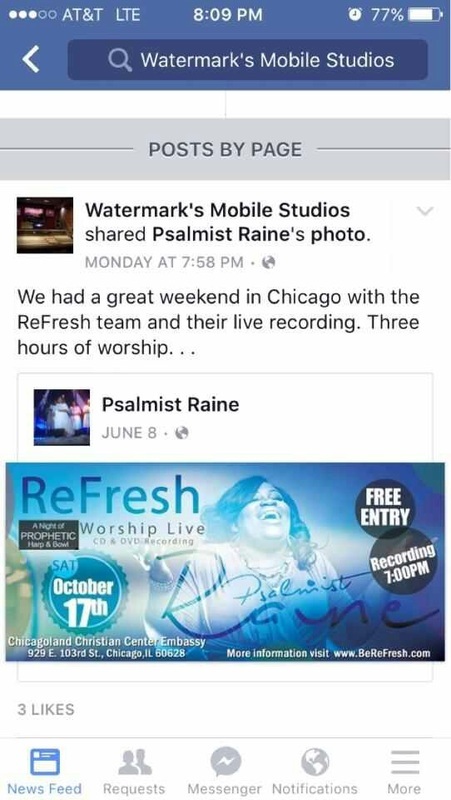 In addition to preparing for the upcoming ReFresh workshop, Raine has been tapped to minister on TBN in Chicago. Raine will be singing songs during the morning and evening Praise-A-Thon on WWTO-TV Channel 35 in Ottawa, IL, on Friday, March 6th. In addition, she is readying her upcoming live recording scheduled for September 2015. 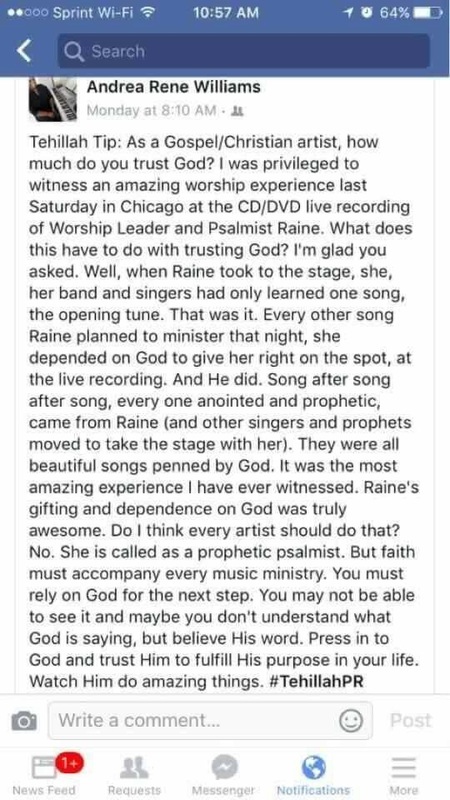 Music and worship have always been a part of Raine’s life. Growing up in a home filled with music, her parents recall her humming the theme song to “All In The Family” at the age of 6 months. Both sides of her family were gifted with music, even through multiple generations. She has been singing the praises of God since the age of 4 and began hitting the airwaves singing on the Isabelle Joseph Johnson radio show on Sunday Mornings at 6AM. At the age of 8 she was featured on the Gatling’s Radio Program on WYCA 92.3 FM, also in Chicago. In college, Raine became a member of the University Choir at Grambling State University in Grambling, LA. Throughout her Gospel music career, Raine has worked with a number of artists including LeCresia Campbell, Bridget Campbell, Todd Dulaney, Kevin Gray, Maurice Griffin, Ernie Allen, Lonnie Hunter, Cynthia Nunn, Darryl Hallman, and Leon Dubose. She’s been blessed with countless opportunities to sing and for Raine, it all comes back to worship. For more information on Raine or the ReFresh Worship Summits, log on to www.BeRefresh.com. Connect with Raine on Facebook and Twitter (@psalmistraine). Another press release of Raine at: http://cribbsification.com/?p=2280 ! Check it out!